The famous Afghan singer, Aryana Sayeed, supporter of La Chaîne de l’Espoir, performed at the Gymnase theatre in Paris on Saturday, 13 May. 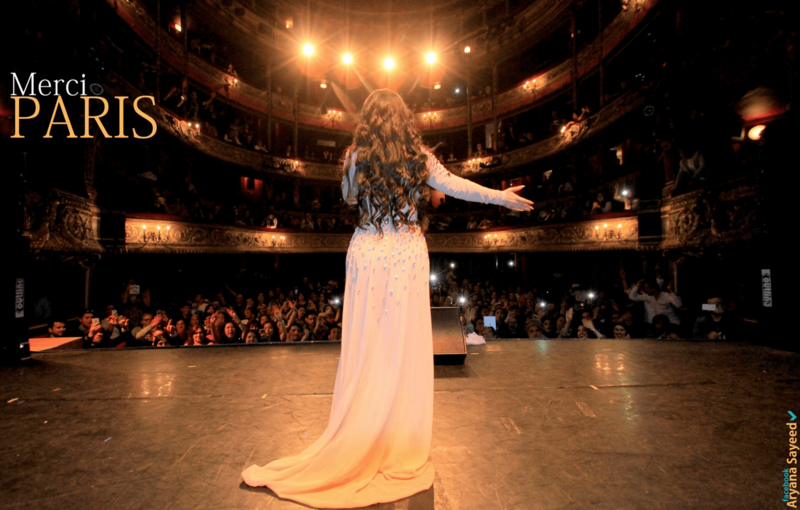 The diva started singing her most famous songs in a packed theatre with her excited fans singing along. During her first visit in Paris, Aryana Sayeed chose to share with her public a matter that is important to her: the treatment of the most vulnerable sick Afghan children. In-between songs, she has taken the time to describe her last visit to the Children’s Pavilion of La Chaîne de l’Espoir located on the campus of the French Medical Institute for Mothers & Children (FMIC) in Kabul. La Chaîne de l’Espoir takes care of poor children from all over Afghanistan during their period of convalescence and pays for all the costs incurred (medical, transport and accommodation). Aryana Sayeed explained how impressed she has been to find out that sick children coming from remote provinces and requiring specialised care, could today be treated for free at FMIC in Kabul in the best of conditions, while some time ago, families who could afford it, had to go to India or Pakistan to access healthcare. Under the applause of her audience, Aryana Sayeed invited everyone to support the actions of La Chaîne de l’Espoir in Afghanistan. After this event, our teams have collected more than €1,000 in donations to be directly allocated to the Children’s Pavilion in Kabul to treat the children on the long waiting list for surgery. Since its creation in 2008, more than 6,000 children have received free treatment at the Children’s Pavilion. It would not have been possible without the support of our generous contributors. We wish to thank Aryana Sayeed for supporting La Chaîne de l’Espoir in Afghanistan and its actions in favour of the most vulnerable Afghan children. With the donations received during Aryana Sayeed’s concert on May 13th, the little Sajida, 5 years old, from Badakhshan province, was treated for free at the French Medical Institute for Mothers & Children (FMIC) in Kabul. Sajida was suffering from a congenital defect called cleft lip and palate, which was preventing her from speaking and eating normally, but also from smiling like any other child her age. Total health care costs amounted to €1,225, which corresponds to 15 months of her father’s salary. Because they could not afford the treatment, Sajida and her father were referred to the Children’s Pavilion of La Chaîne de l’Espoir, which covered for all their medical, transport and accommodation costs during the entire duration of her treatment. The two surgeries she required went very well, her whole family was relieved and a completely recovered little Sajida left the hospital on the 3rd of June. Today, Sajida is smiling again, thanks to the generosity of the people who came to see Aryana Sayeed.